GoPro didn’t just announce one new camera, we’re debuting THREE all-new HERO7 cameras. Yes, HERO7 Black is amazing, but what if you don’t need all the bells and whistles? 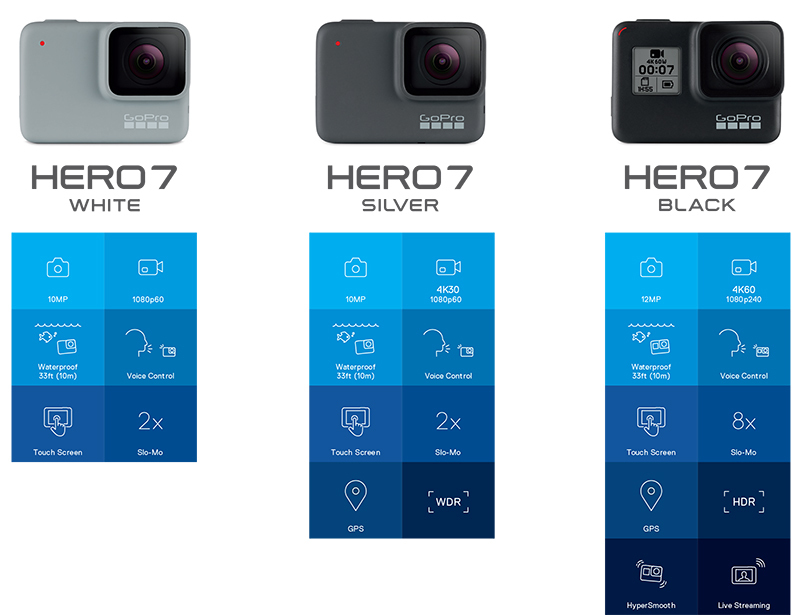 Well, say hello to HERO7 Silver and HERO7 White. The HERO7 Silver and HERO7 White both shoot in three modes: photo, video and tim lapse. They also have built-in electronic image stabilization to smooth out playback of experiences that are inherently bumpy/shaky, whether you’re skiing, snorkeling or chasing your kids around the yard. But what’s arguably most impressive is the entirely redesigned user interface. This new UI resembles the feel of a smartphone and delivers epic content with a few taps of your finger. Plus, new tools, such as vertical capture, the pre-set Short Clips video feature and selfie/group-friendly Photo Timer, take the guess work out of video and photo capture.